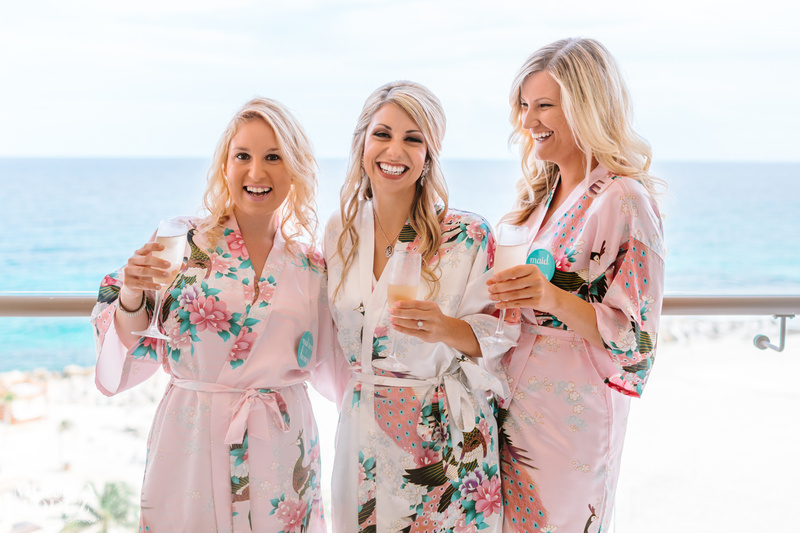 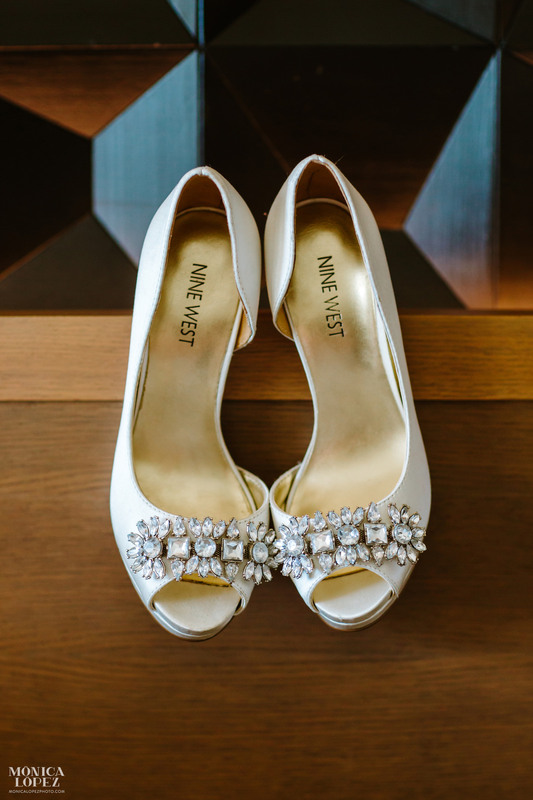 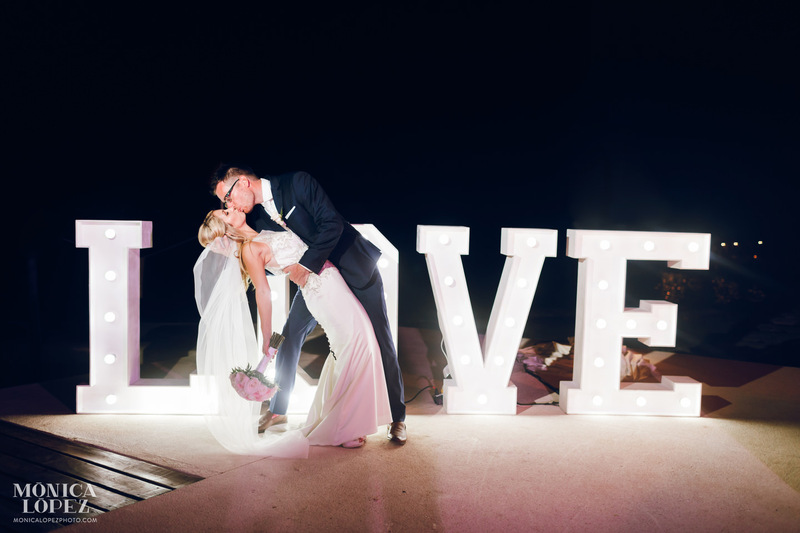 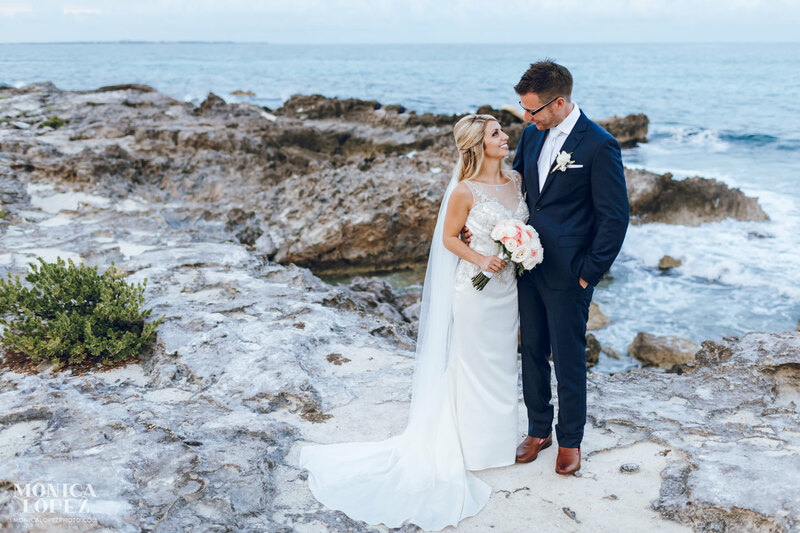 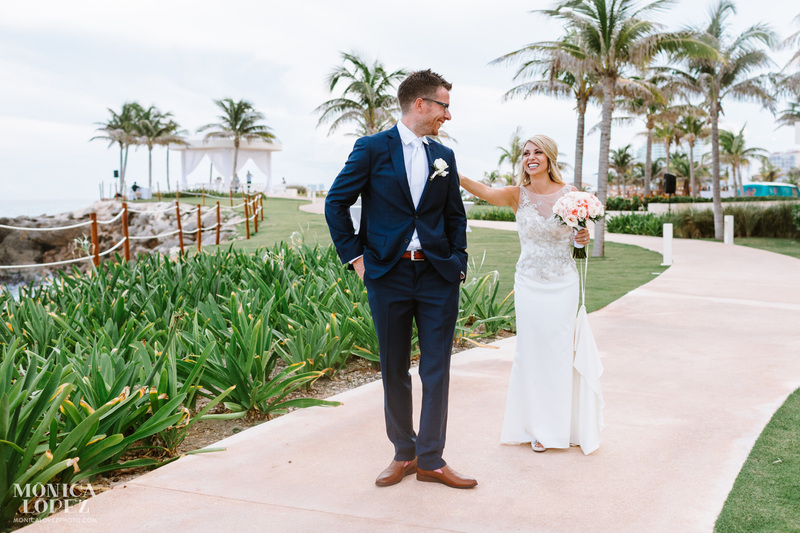 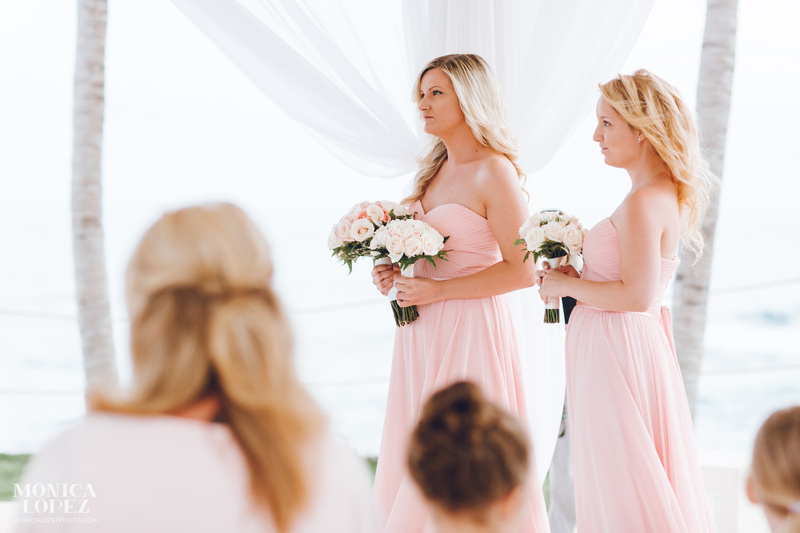 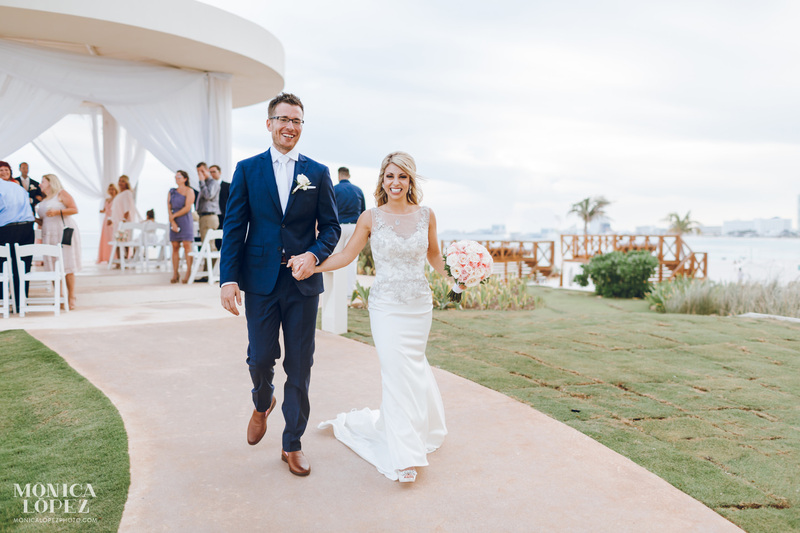 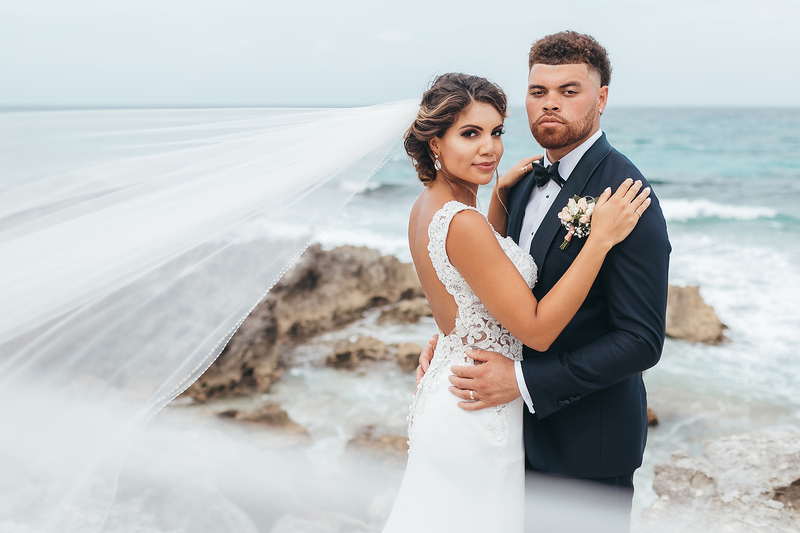 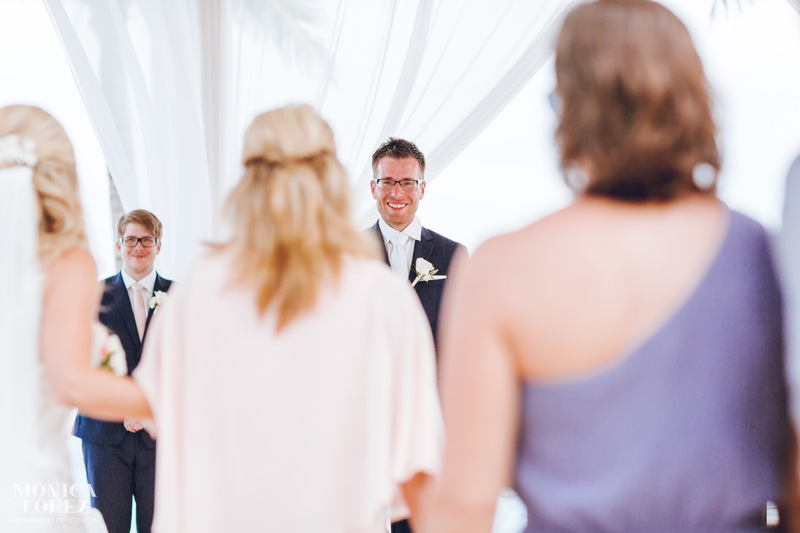 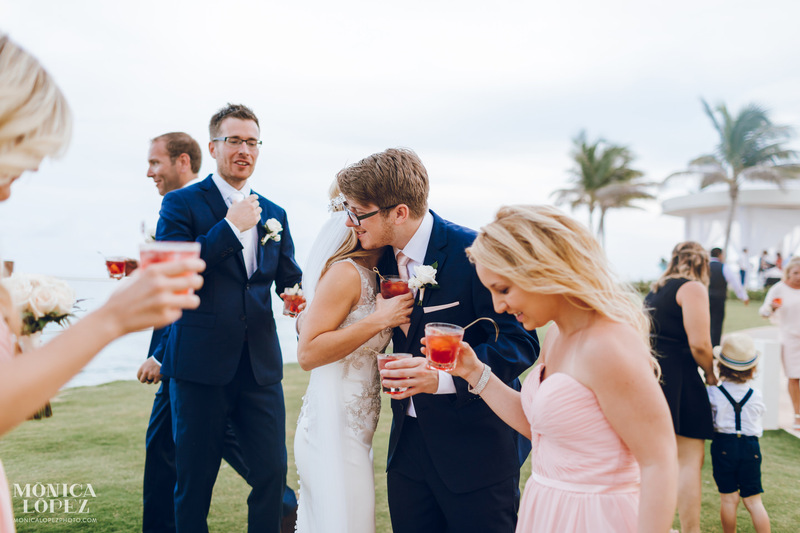 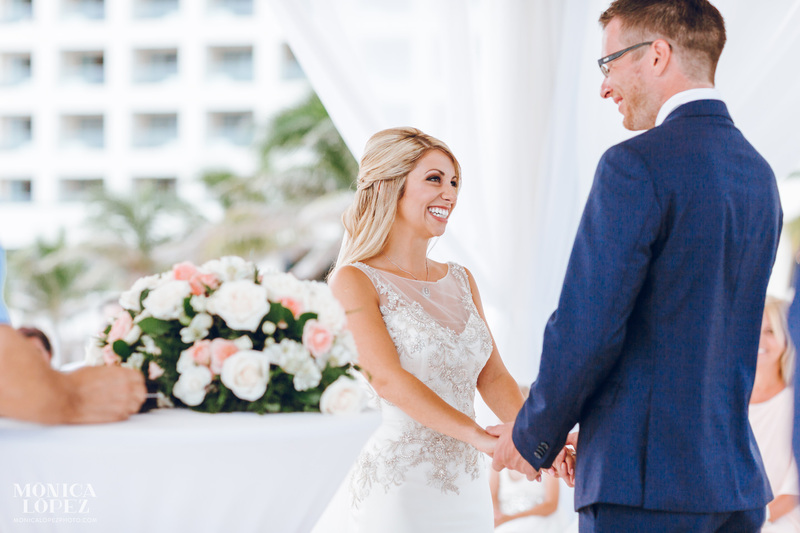 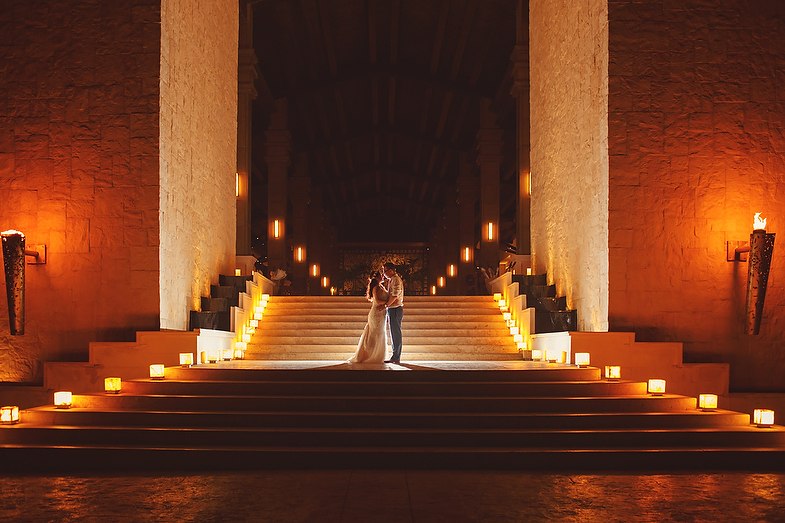 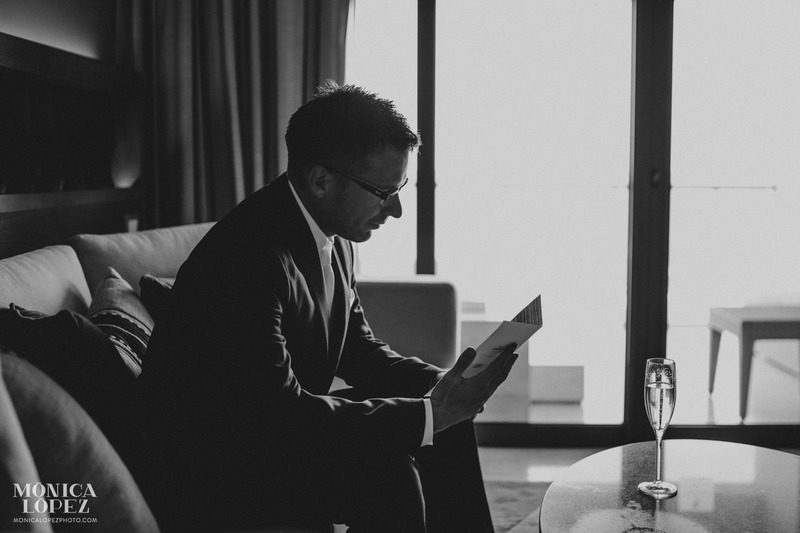 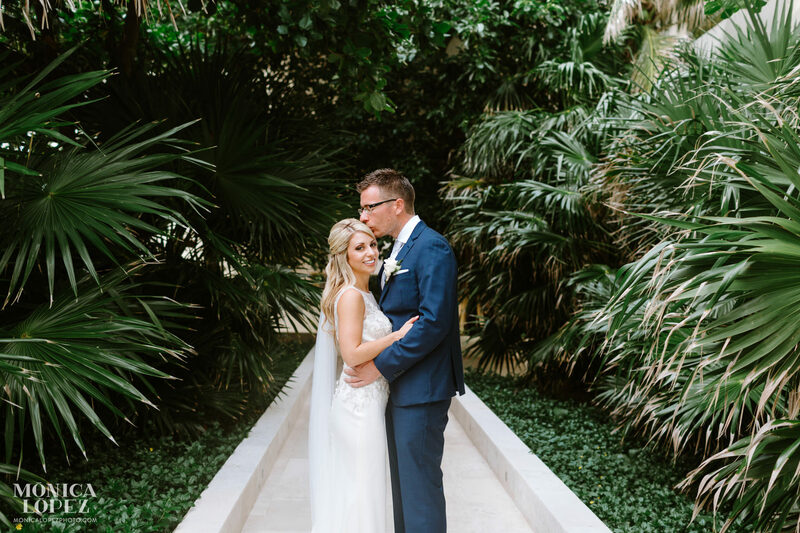 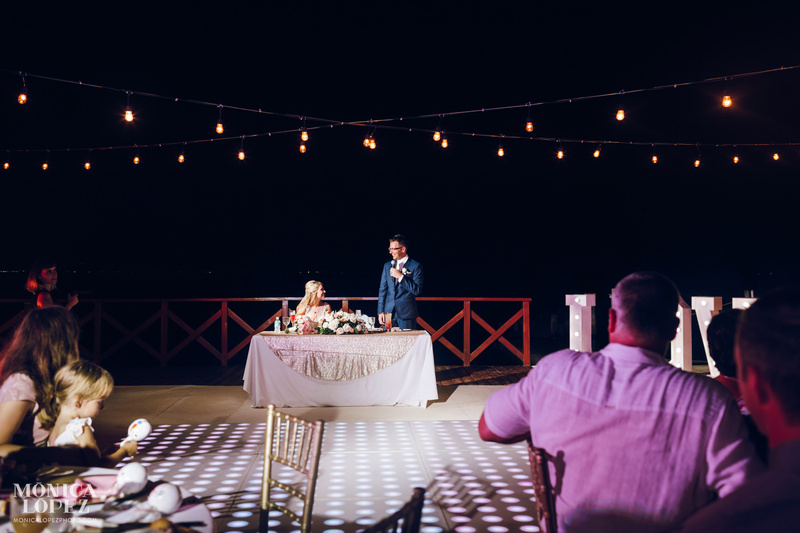 Christine & Tyler’s Hyatt Ziva Cancun Destination Wedding was super emotional for me to photograph. 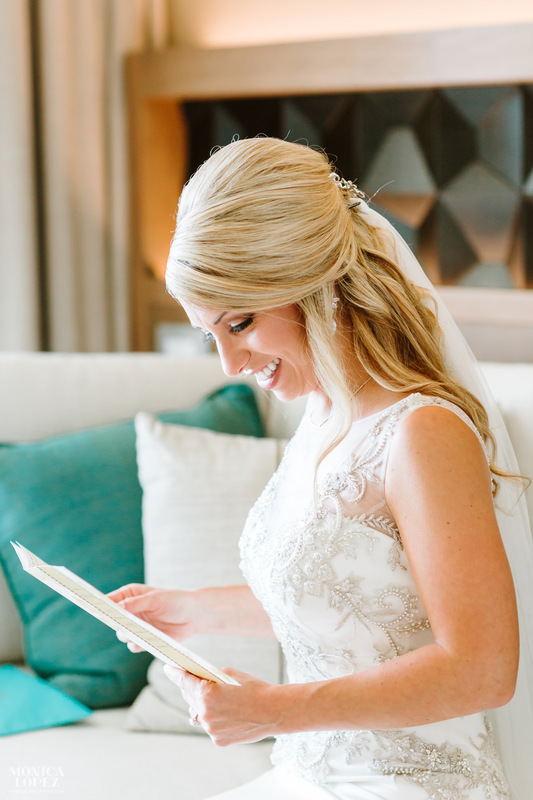 The moment I walked into her room, I could feel all the love and joy from their family and friends, all together and united, ready to celebrate the marriage of two kind souls. 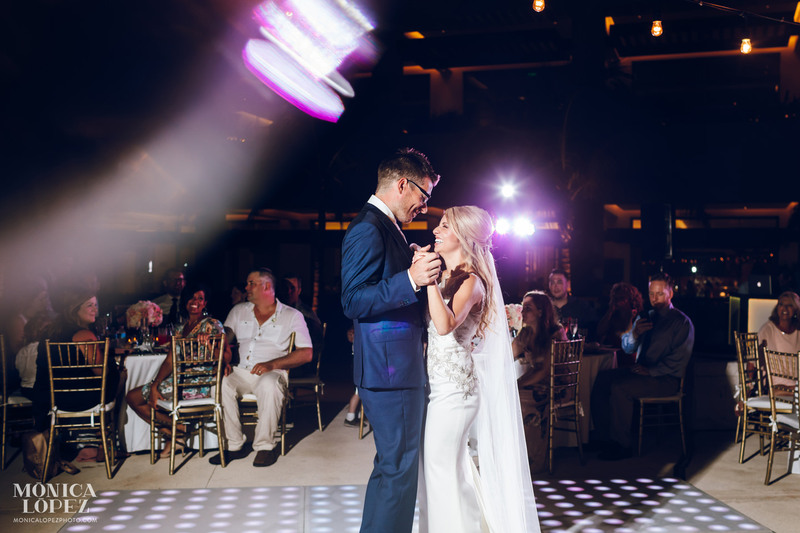 They laughed, they danced, they cried (I cried behind my camera too!) 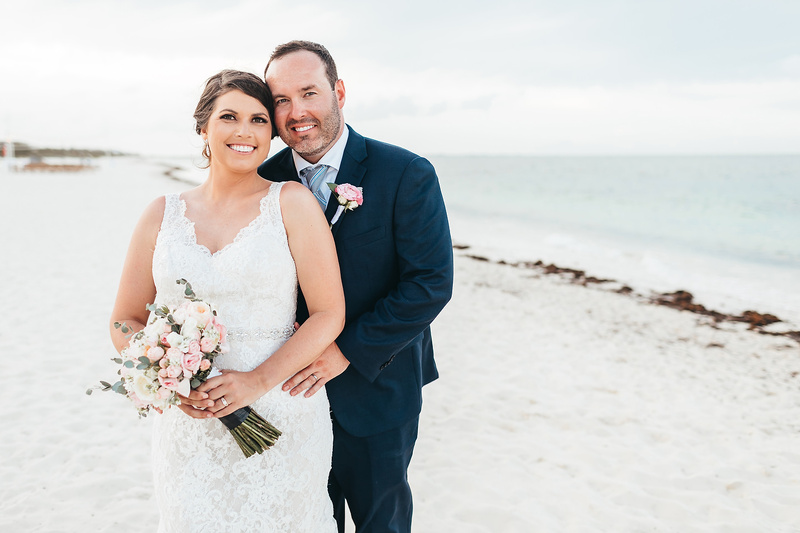 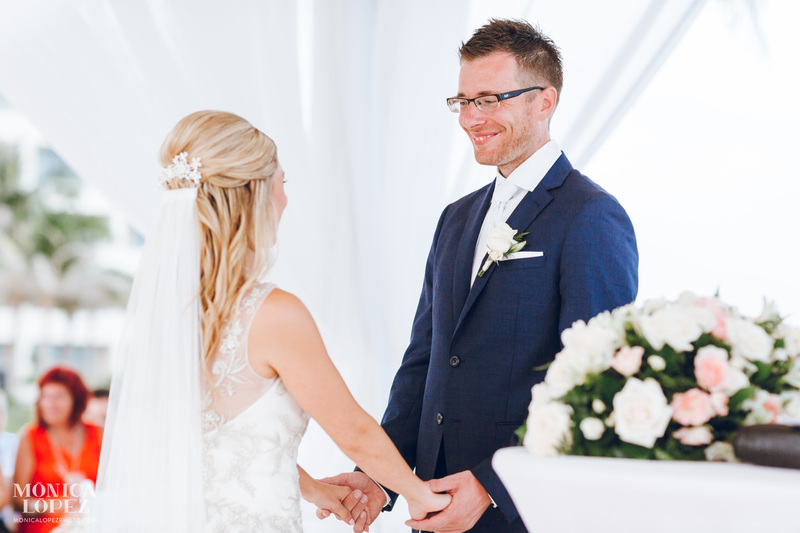 and not even the rain during reception stopped them from smiling. 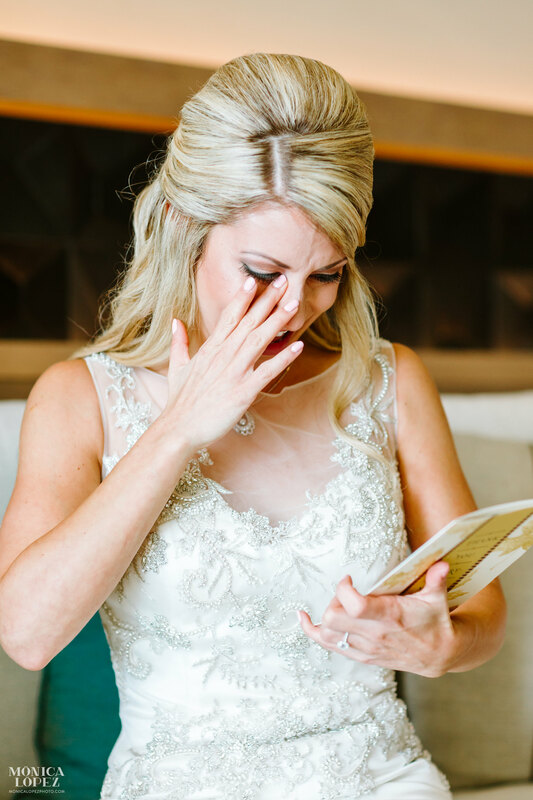 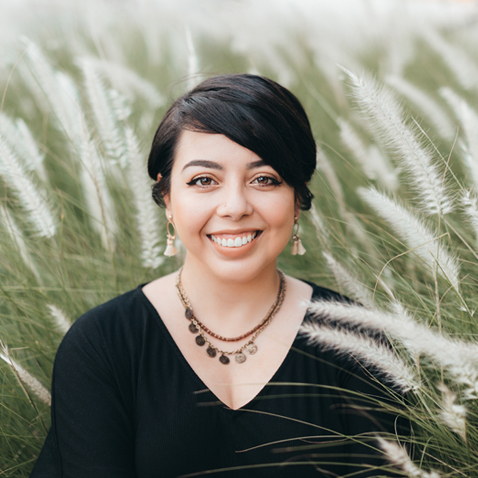 When I was told Christine was using a family heirloom necklace that belonged to her grandmother who passed away in New Years eve 2016, I knew she was also with us that day. 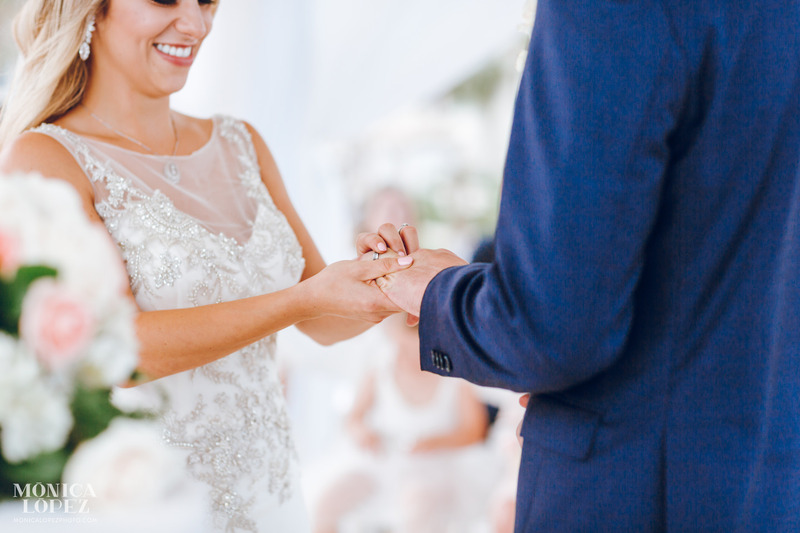 Christine also implemented a pearl button on the back of her dress, which was formerly a button that belonged to her mother in law wedding dress – I know we are all thinking this could easily start a new family tradition! 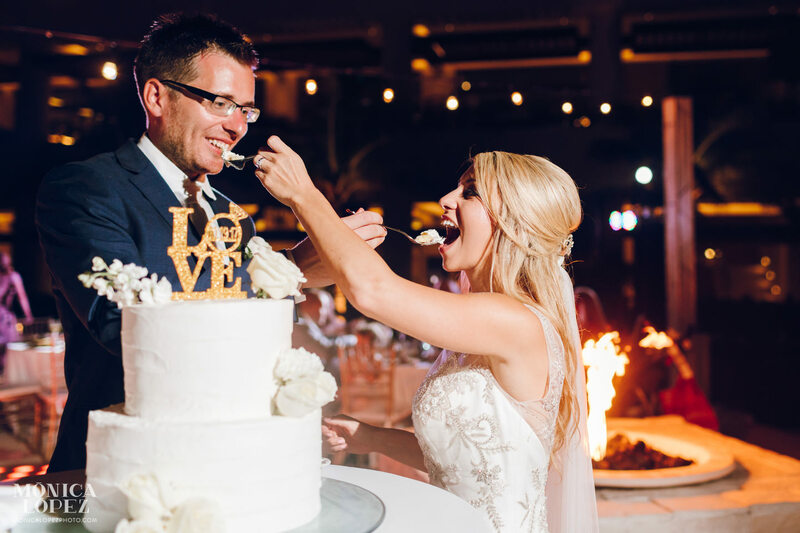 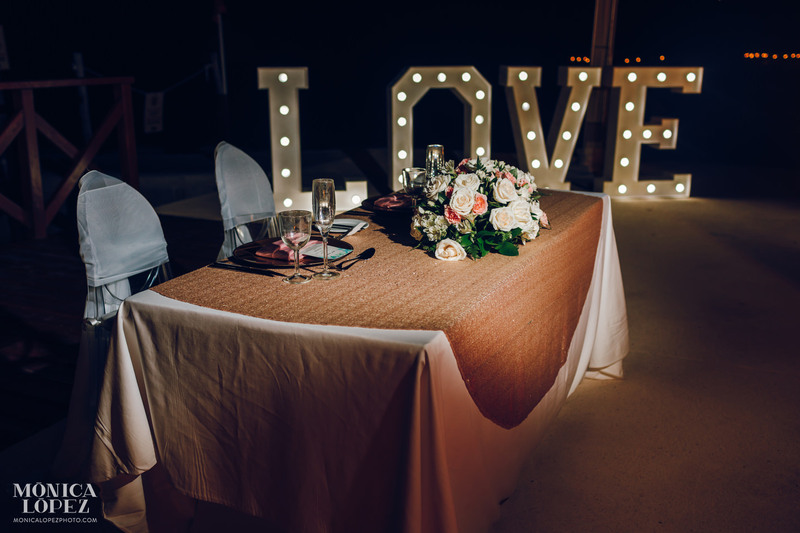 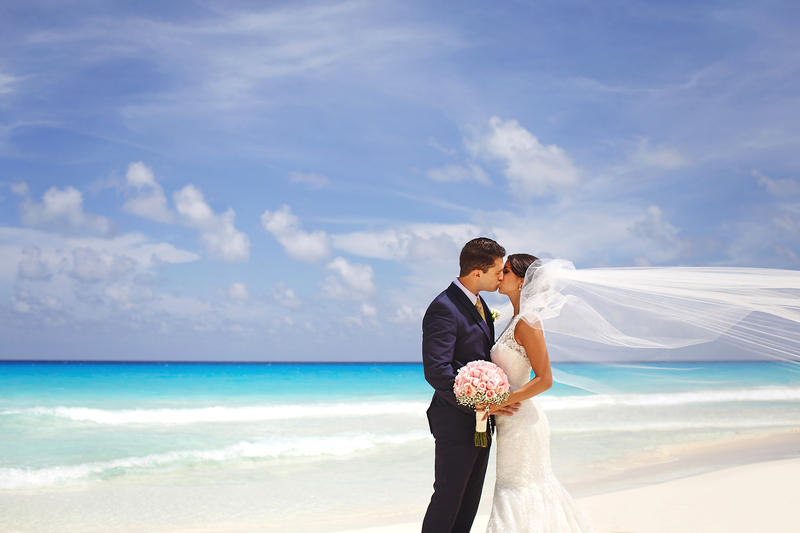 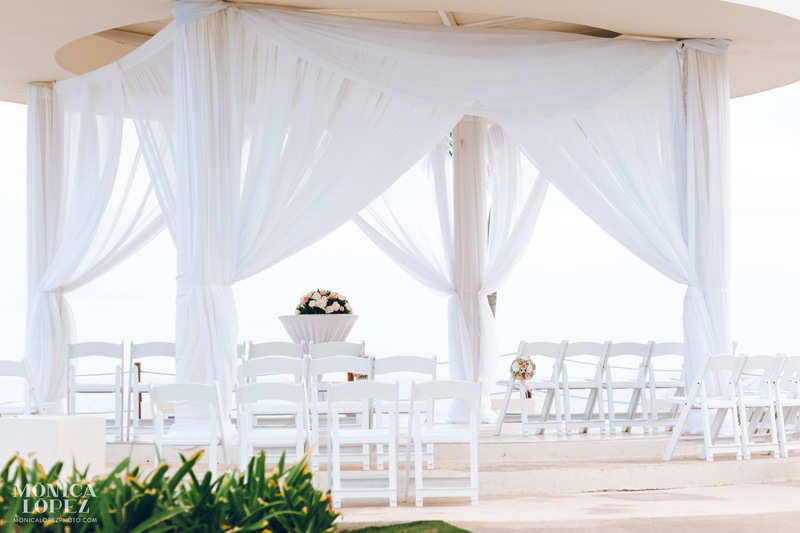 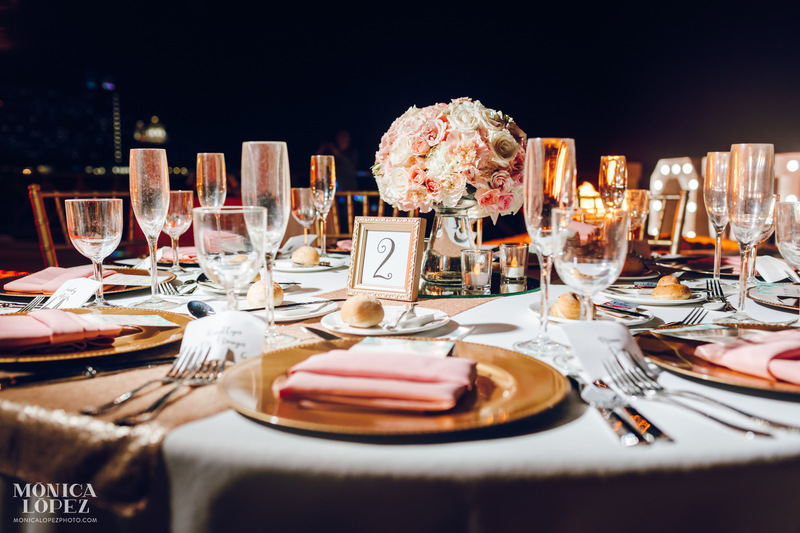 Why did you picked Hyatt Ziva Cancun for your wedding? 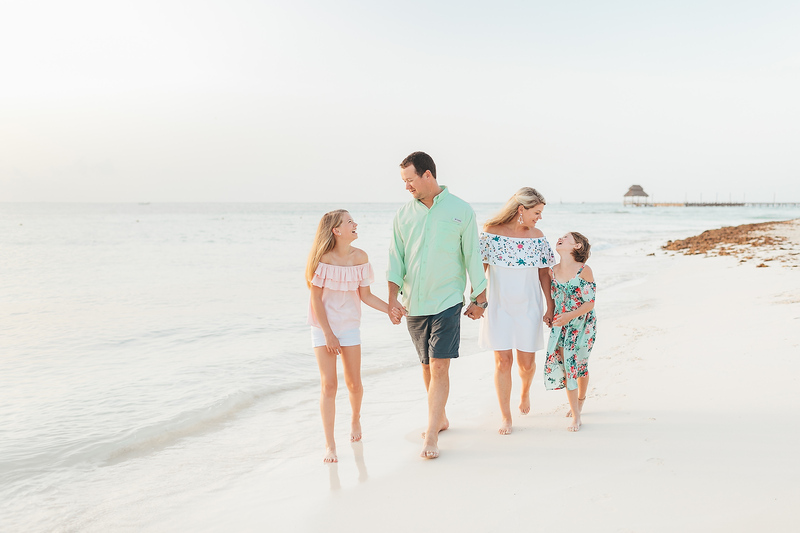 I have been travelling to Cancun with my family since I was a teenager. 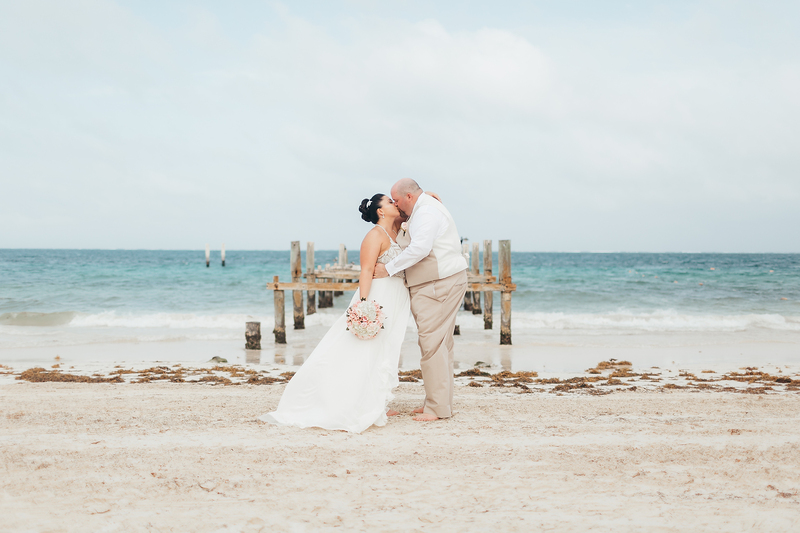 We have always loved their incredible beaches and blue waters. 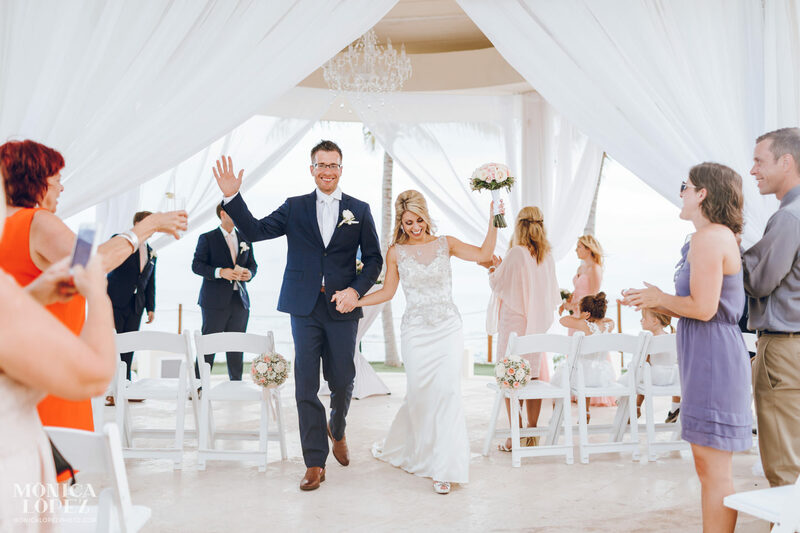 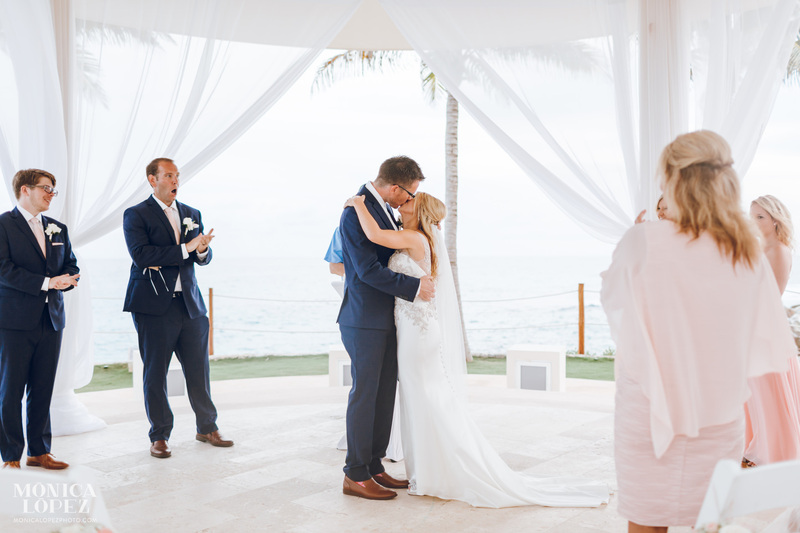 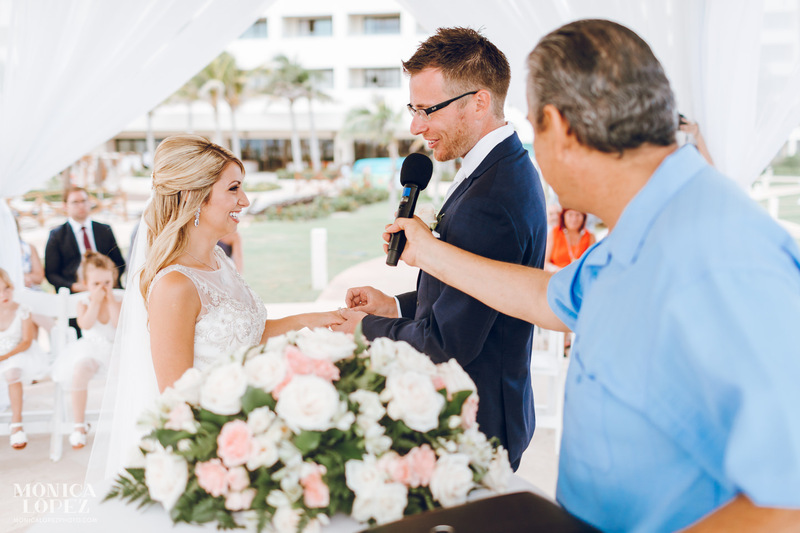 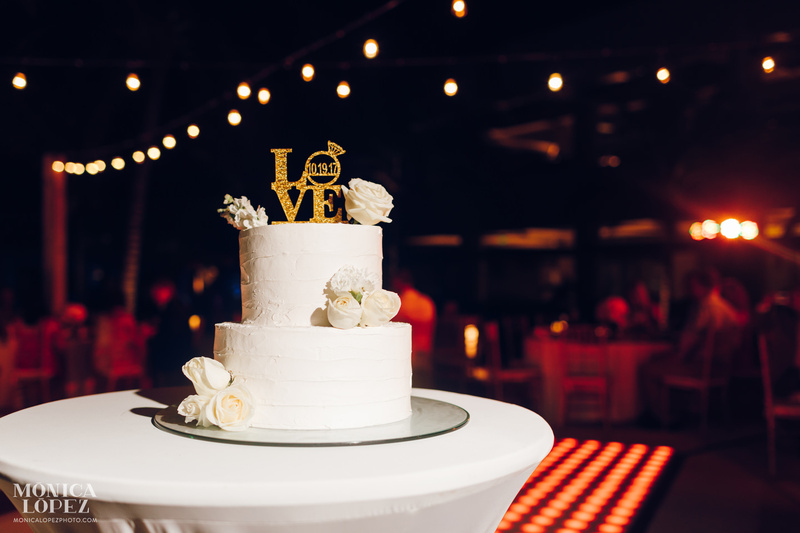 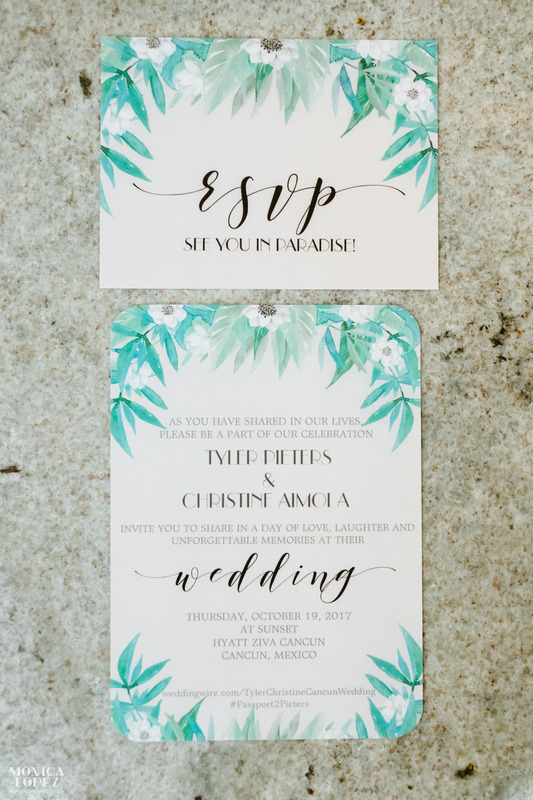 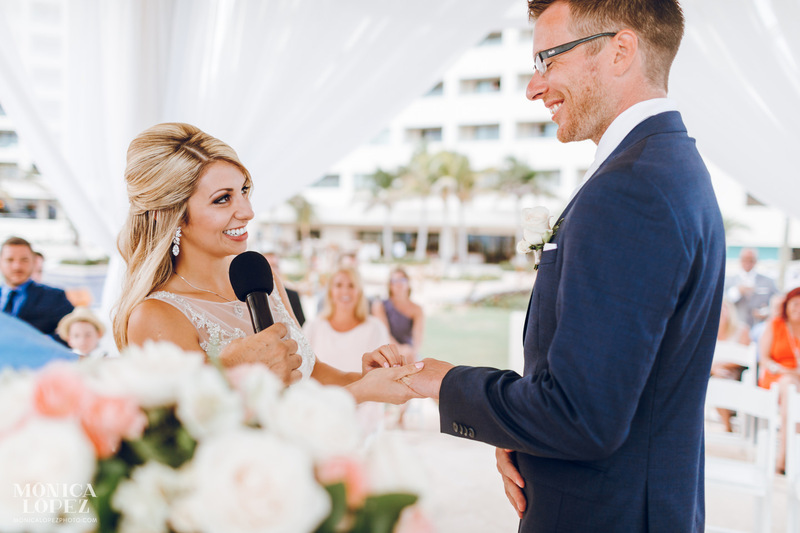 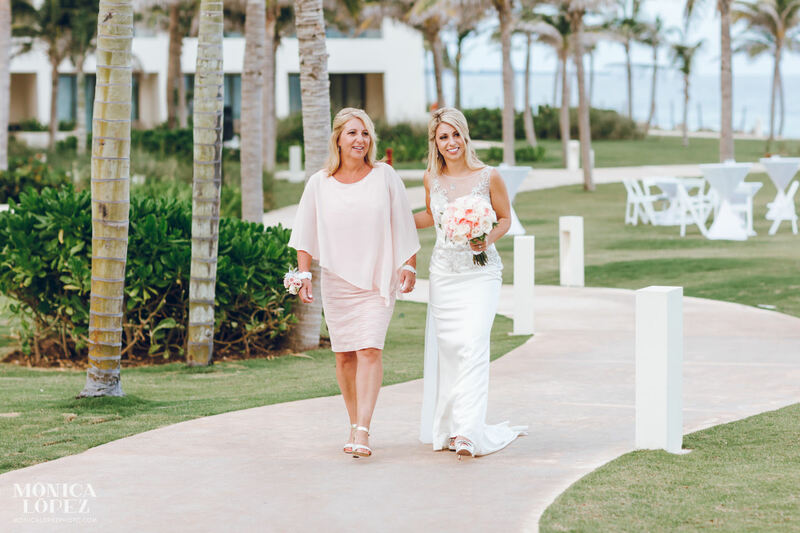 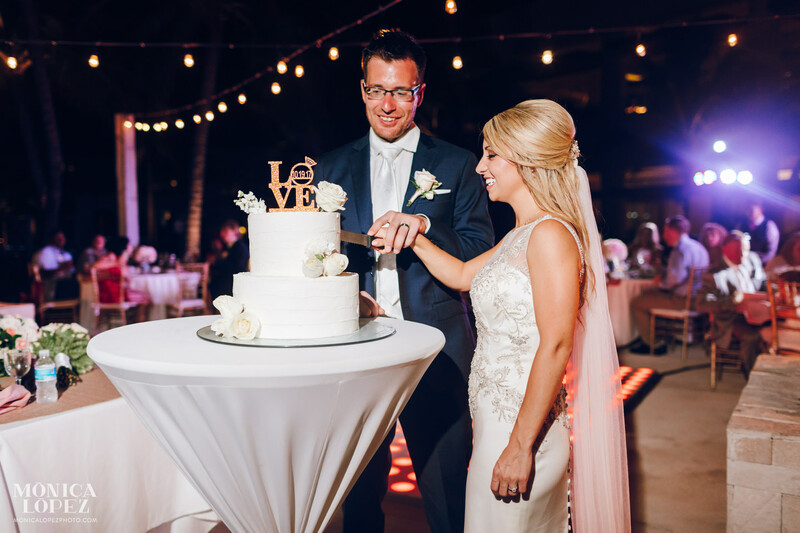 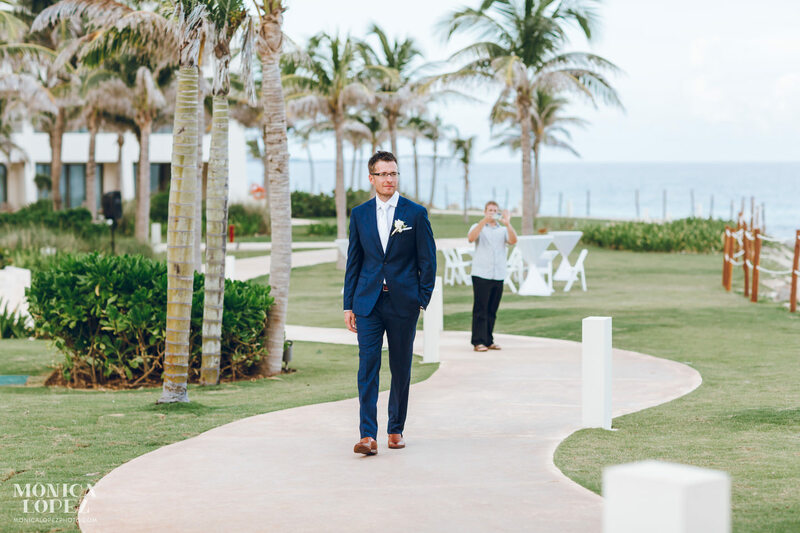 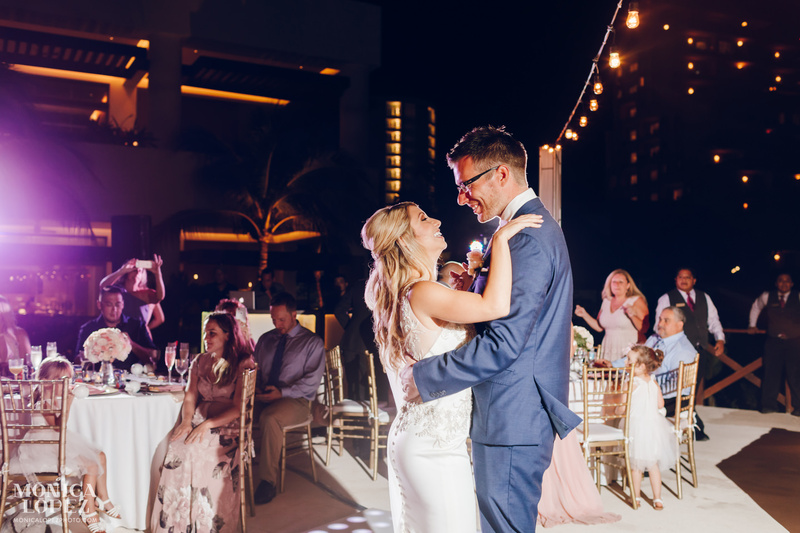 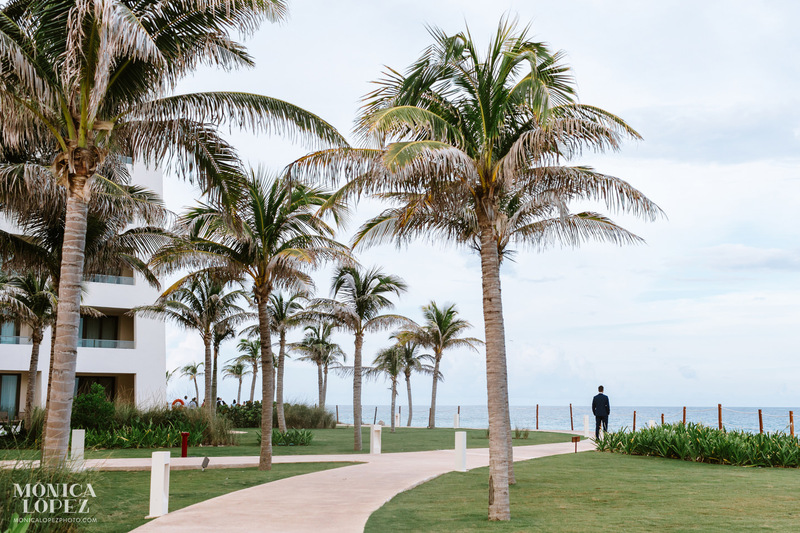 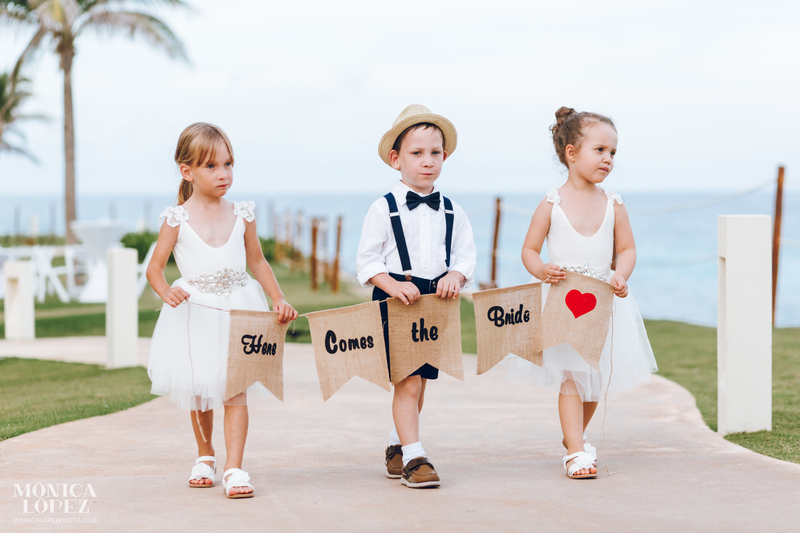 We had vacationed at Hyatt Ziva Cancun shortly after it opened in April 2016 and immediately knew it was the perfect place to bring our family and friends to get married! 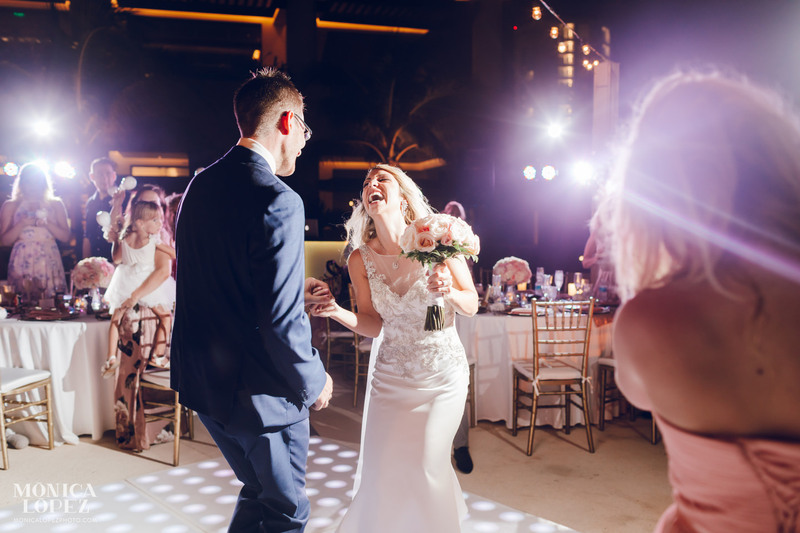 Our most memorable moment was walking into the reception and seeing all our guests shaking their maracas! 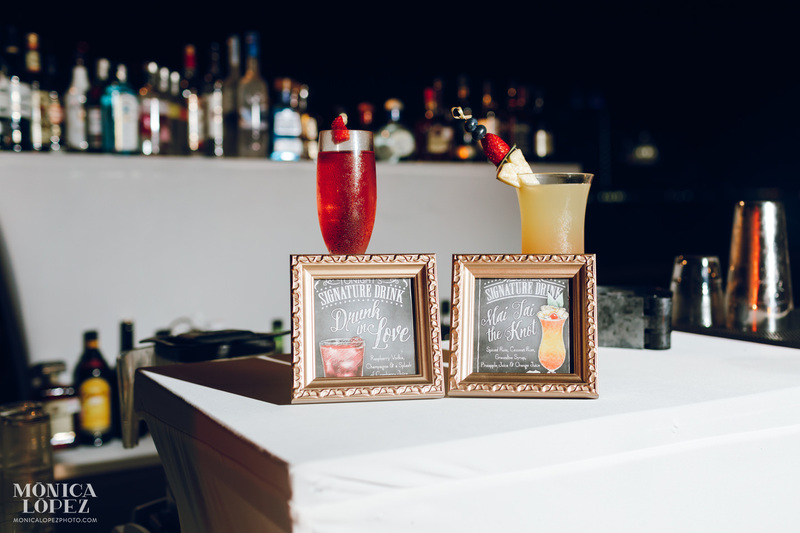 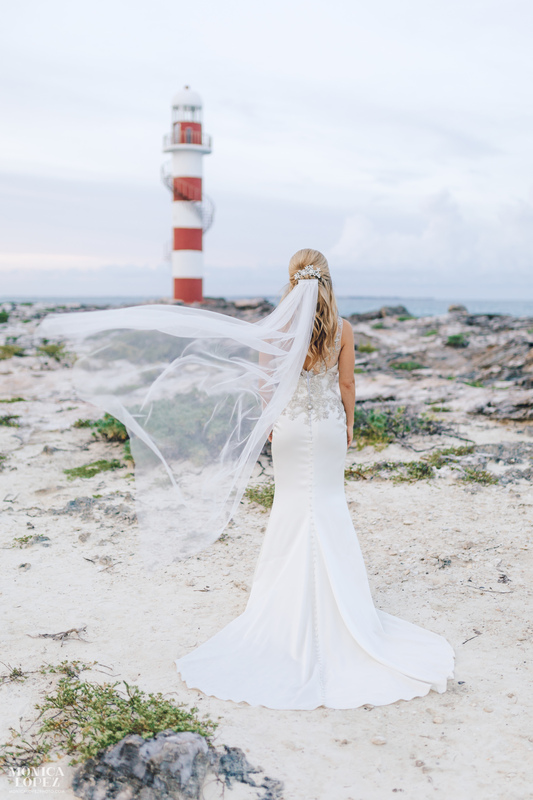 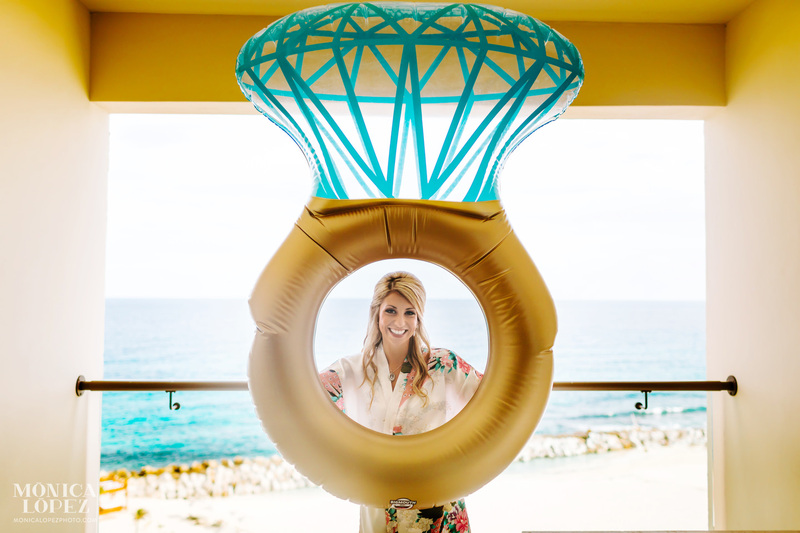 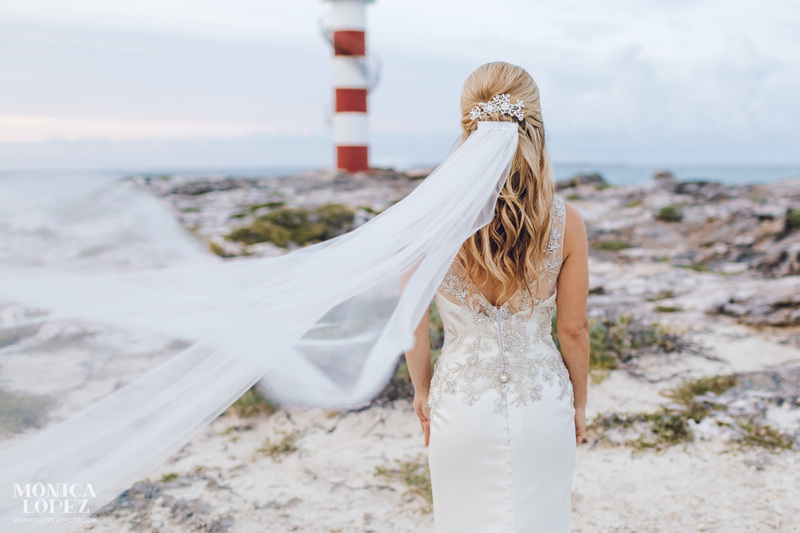 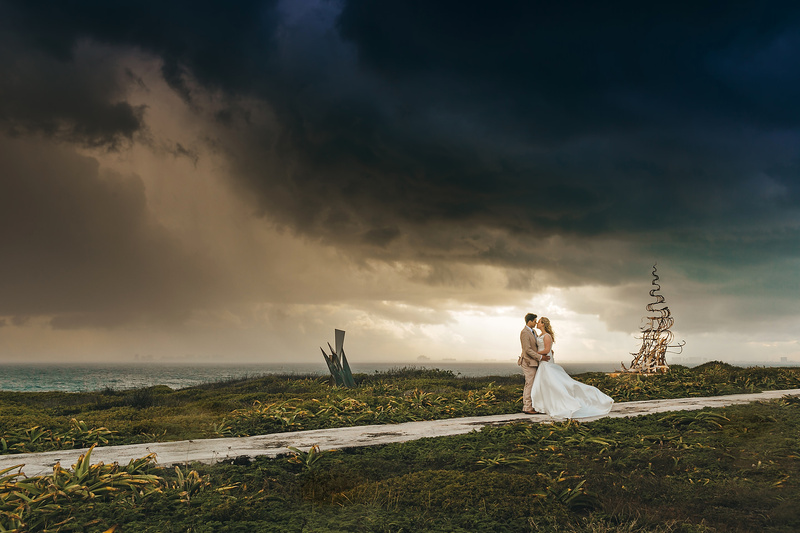 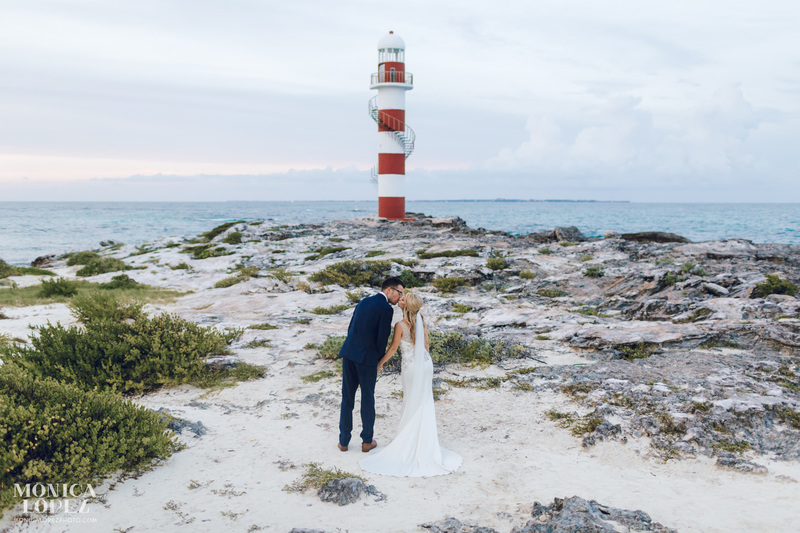 Do you have any tip for destination brides marrying in Cancun / Mexico? 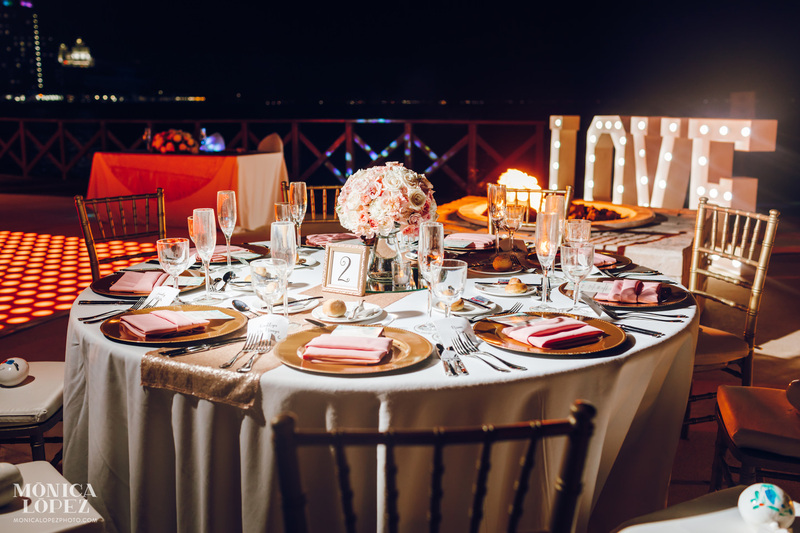 Do as much planning as you can ahead of time so you can enjoy spending time with your friends and family! 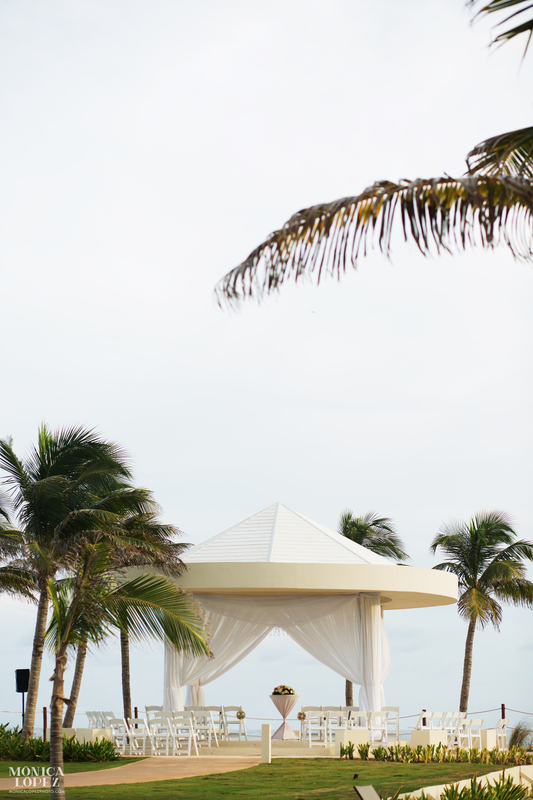 Also, prepare for the insane heat and humidity! 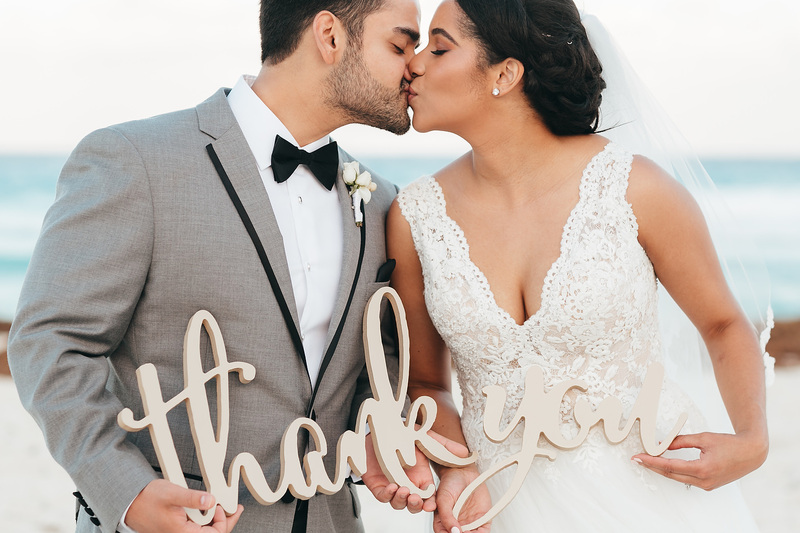 Monica and her assistant were incredible. 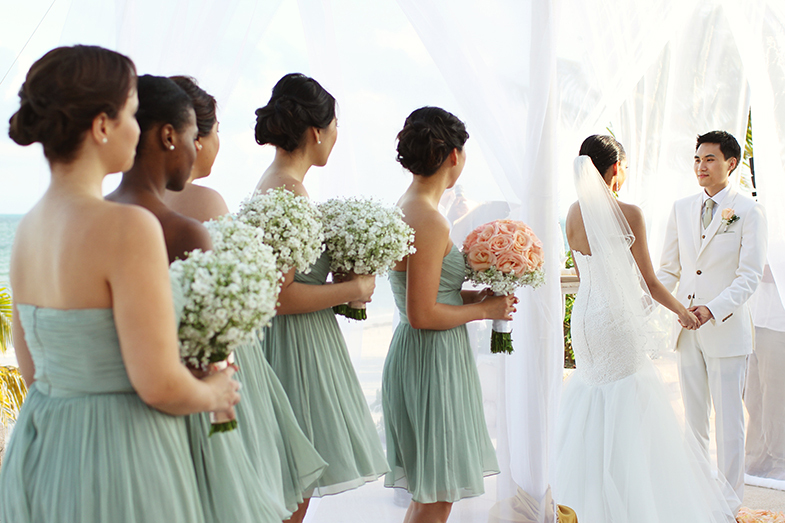 They were on time and captured every special moment of our day. 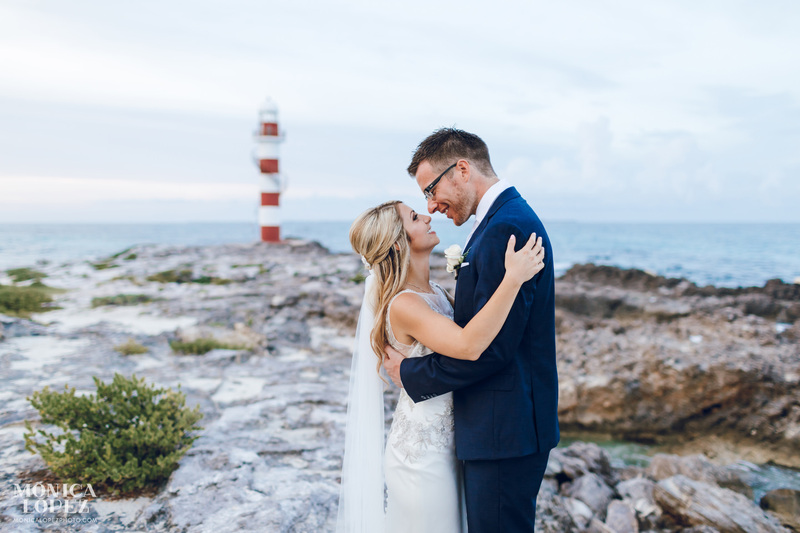 She knew the resort and the perfect places for all of our pictures! 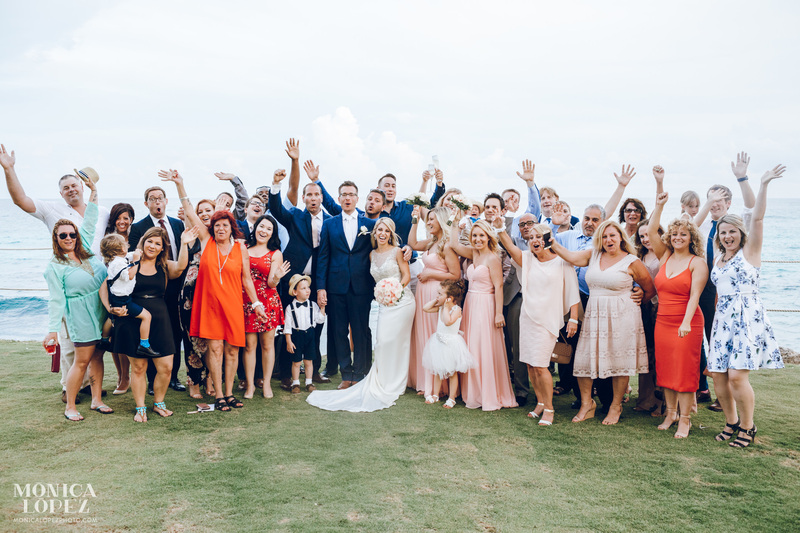 We love the lighthouse photos because they are so special and unique but our favourite photo has to be the group photo of all of our friends and family! 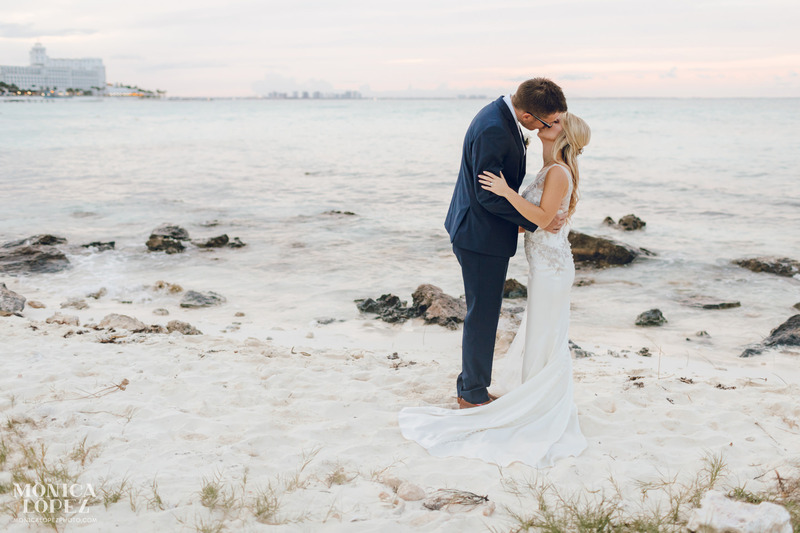 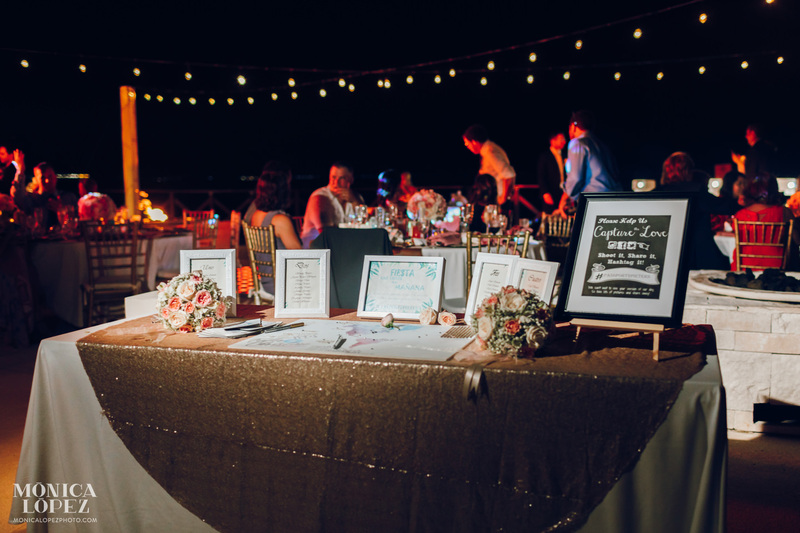 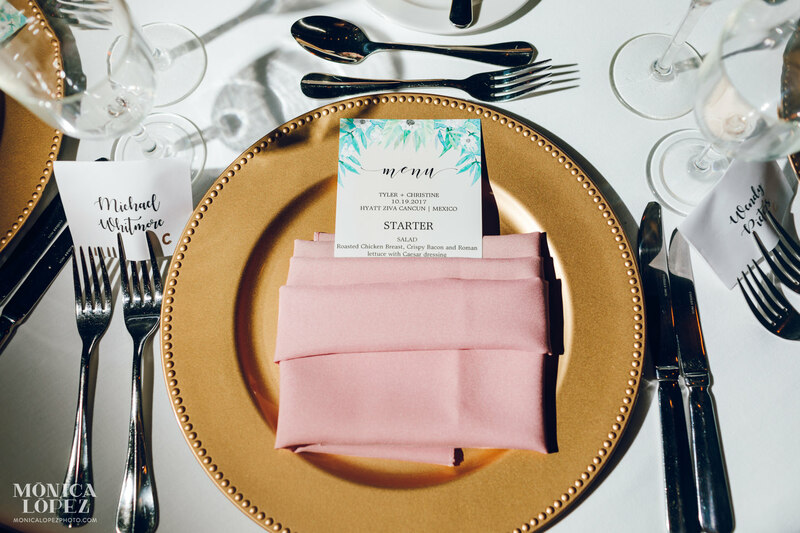 Christine & Tyler’s wedding has been already featured in Destination Wedding Details what an honor! 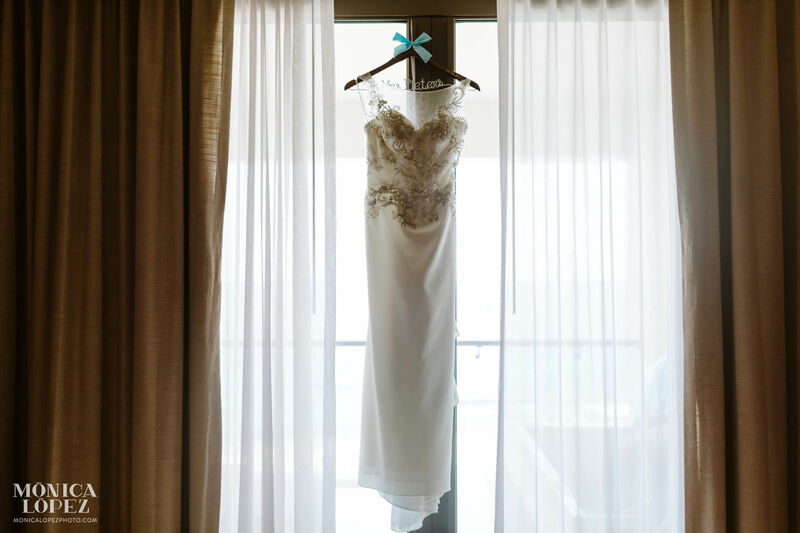 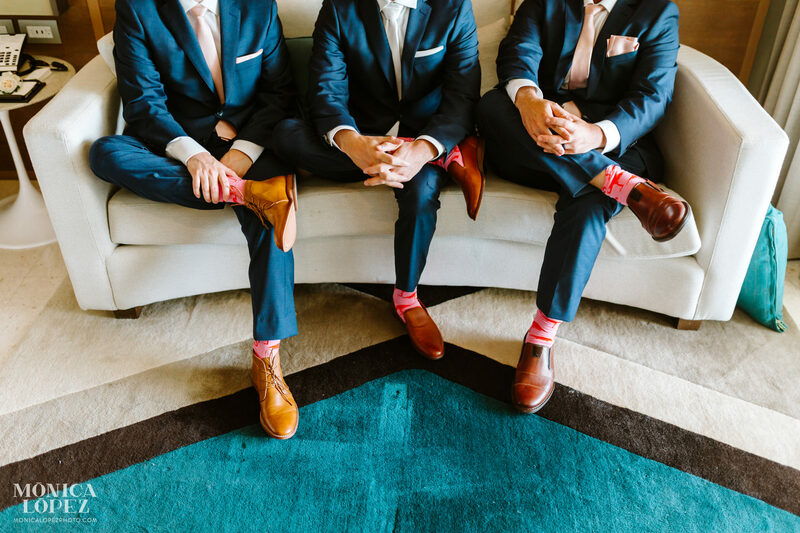 Don’t forget to click on “View More Photos” to find more inspiration for your wedding day! 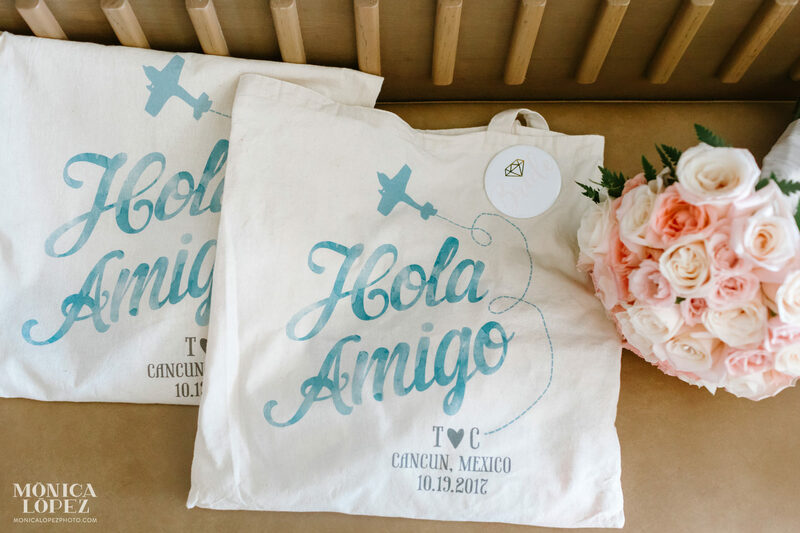 Casa Blanca Bridal (gown), GAMA (Party Music Events), Wedding Chicks (Welcome bags), Zazzle (Stationary).